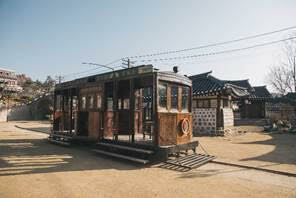 Global Travel Media » Blog Archive » Travel through the set of Mr Sunshine! 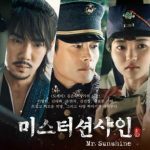 Mr Sunshine is a South Korean TV series written by Kim Eun-Sook and directed by Lee Eung-Bok. The hit show recorded the 3rd highest rating for cable television in Korea and has also premiered internationally on Netflix since July 2018. The series is set in the 1900s Hanseong, (the former name for Seoul) and follows the story of two main characters Eugene (Lee Byung-Hun) and Ae-shin (Kim Tae-ri). Eugene is a servant boy from Korea that moves to America and becomes a US Navy officer, and lady Ae-shin is the daughter of a highly respected household, but against all expectations becomes an activist fighting for Korea’s independence. The show received critical acclaim for its beautiful cinematography and storytelling. 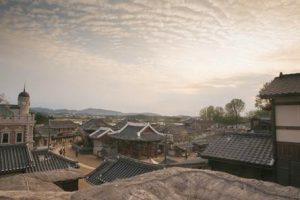 In this article, we travel through Korea’s history to some of the picturesque locations of ‘Mr Sunshine’, where you can relive some of the iconic scenes. The American Embassy is the temporary office for Eugene during his stay in Korea. This is also the location where Eugene and Ae-shin first find out about each other’s identity. 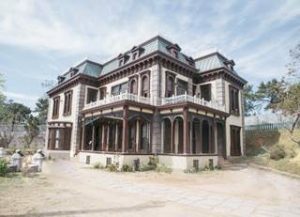 Historically the American Embassy was located in Jeong-dong, Jung- gu in Seoul however the filming for the drama took place in ‘The House of Unbo’. This magnificent hanok housing was residency to the hearing impaired artist Kim Ki-Chan, who is most well-known for drawing the portrait of King Sejong on the 10,000 won Korean bill. The house now a runs as an arts and culture centre where you can appreciate, traditional Korean architecture, the art of Kim Ki-Chan and the peaceful gardens. The 1900s was a time of great turmoil and change for Korea, the ‘Hermit Kingdom’ was slowly opening up to foreign influences and many Christian missionaries started operating schools. This can also be seen through the scenes where Ae-shin attends school to learn English. The actual location for the school is ‘Hanhak-chon’ within Keimyung University’s, Daegu. ‘Hanhak-chon’ is a reconstruction of a Korean folk village and opened in 2004 to celebrate the 50th anniversary of the university’s founding. 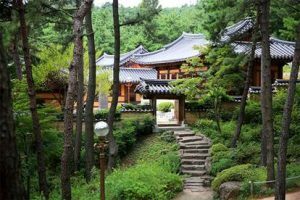 Within the village, there is also a beautiful garden with a pavilion as well as many cultural classes where you can learn calligraphy, traditional Korean instruments and also enjoy tea ceremonies. For those who want to really immerse themselves in the world of ‘Mr Sunshine’ Nonsan Sunshine Studio is the place to go. Most of the series was shot in this location and it’s now open for the public to visit. Here you can see some of the iconic monuments and buildings that were in the film, such as the Glory hotel where you can enjoy a cup of ‘Gabe’ (coffee) or even take a ride on the working tram. To make your experience complete visitors can also borrow a traditional Korean hanbok, and recreate some of their favourite scenes.